Enhance the security, by applying a lock to protect your application settings. You can also hide the application in background to keep performing video surveillance. To configure security Settings, click File>> Settings >> Security. Set a Password and nobody will change application settings without your consent. Cameras will be available for user to preview. Once the application is locked, the user will not be allowed to close Webcam Monitor. Selecting this feature will lock the application setttings on OK click. Once the user unlocks the application, the Secure Access option will be unchecked. Once you set up a password, the Set Password button will be toggled to a Reset Password button. You need to enter the old password to reset the password. On selecting the Make Password visible you will be able to see your entered password. Note: Password should be at least 4 characters long. Please remember the password or store it in a secure place to unlock and access the application settings. If you forget the password, the only way to remove the password is to uninstall the application completely from your PC and then reinstall it. This will require re-entering your camera configuration and alerts. 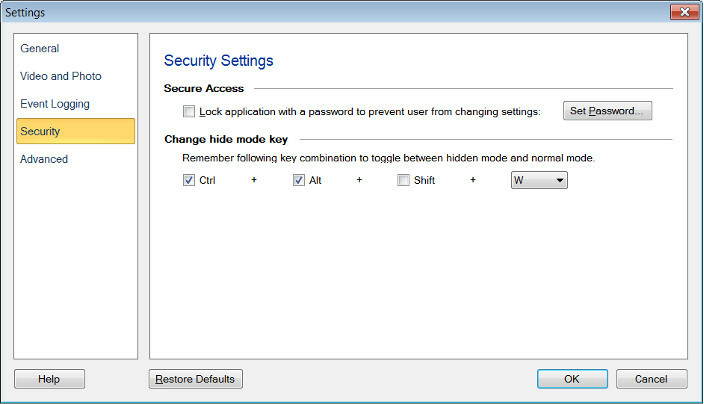 Set the hot key combination to hide or unhide the application from the PC screen to conceal the surveillance from intruders. Remember this key combination and use it to switch between hidden and visible mode. Learn more about Hide Mode.